My name is Tracy and I have appliance envy. Serious Appliance Envy. As a long time apartment dweller, I've been relegated to a ton of sub par appliances, many of which have long needed replacement, but that's certainly a story for another day. 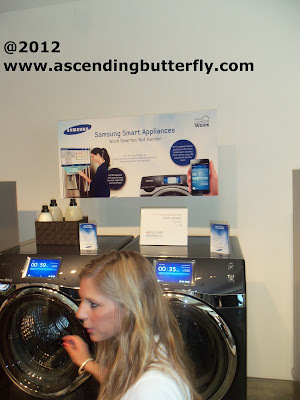 I recently attended a product demo for Samsung where various appliances were set up and press were given a walk through of each model and it is then and there that I learned I have 'Appliance Envy', while probably not as deadly as my summer 'travel itchies' disease, it's painful none the less. In a very brief time I learned I have been working way harder than I should in the kitchen and in other rooms. I had no idea just how far Household Appliances have come. But I now know just how far behind my particular kitchen is. Whether it's a future appliance overhaul or a complete move that fix remains to be seen (both sound equally appealing to me right about now!). The new 32 cu. ft. French Door Refrigerator has enough room to fit up to 32 bags of groceries! 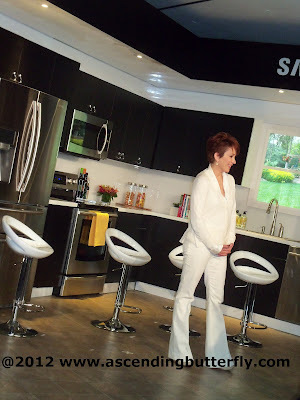 Samsung Electronics America, Inc., America’s fastest growing home appliance brand and award-winning innovator, take organization and efficiency in the home to a new level with the launch of its line of 2012 smart home appliances. Samsung is dedicated to using its technological expertise to create moments of wonder for today’s busy moms. Its line includes a Wi-Fi-enabled LCD refrigerator with apps that redefines organization in the kitchen, a smart phone-controlled washer/dryer for more freedom from the laundry room and a 5.9 cu. ft. large capacity oven that can be divided into two separate ovens for unparalleled meal preparation flexibility. I'm not sure how they heard me when I was praying to the Twitter Gods about the ability to conduct and participate in Twitter Parties from my Refrigerator as Twitter Parties invariably make me hungry, and somehow they heard me. I wanted to stand and play at that refrigerator all day but unfortunately other people seemed to want to see it too, (How dare they? It's MINE all mine!) so I had to admire it, drool and move along! SO WHERE DOES PATRICIA HEATON COME IN YOU ASK? 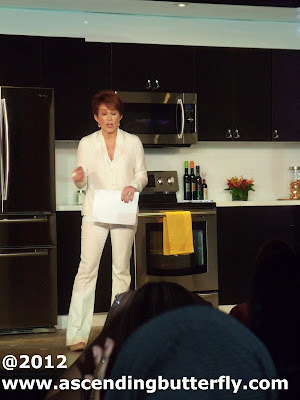 Patricia Heaton, America’s favorite high capacity mom and the star of The Middle joined Samsung for the official unveiling of the new product line. In addition, Samsung is teaming up with Patricia and a team of top experts to launch “Make Your House Work,” an online program that will provide ideas, inspiration and recommendations for Samsung home appliances to keep your house operating at peak performance. The panel which included Patricia Heaton on the very left (in the photo above the solo shot), and to Patricia's right Julie Morgenstern (aka 'The Queen of Putting People's Lives in Order and author of 'Organizing from the Inside Out'), Liz Pryor (Good Morning America's parenting 'Advice Guru'), and Christina Stanley-Salerno (Blogger for Rachel Ray Magazine Online). Samsung’s new product line for 2012 includes more connectivity, capacity and convenience than ever before to help moms stay efficient and organized. A new national consumer survey of over 750 moms conducted by Samsung with Blue Suit Mom, an internationally recognized resource of work and family balance information for working mothers, highlights the challenges that moms face in organizing their lives and managing their households. For the vast majority of moms (85 percent), housework is a frustrating activity (not sure we actually needed a survey to determine that one right ladies? ), and 76 percent never feel caught up on it. And although 69 percent recognize the important role that technology can play in making their lives more organized, 59 percent don’t know where to start to make housework easier. 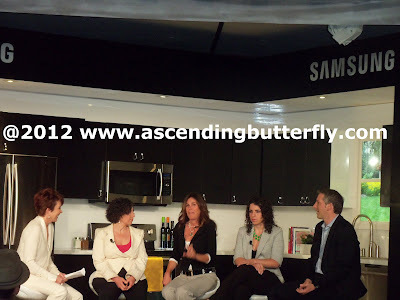 The Samsung survey was conducted in May, 2012 via an online survey fielded to the following networks: BlueSuitMom.com, MomsMindPool.com and MomSelect.com. An ending sample of over 750 Moms completed the online questionnaires. The demographics of the respondents varied in income level, marital status and household make-up. The new Wi-Fi enabled WF457 laundry pair is making laundry smarter and less time-consuming by allowing consumers to start, stop and pause the machine from an app available on smart phones. It also reduces the normal cycle time by up to 15 minutes with new SpeedSpray™ technology by shooting water and dissolved detergent directly onto clothes so that cleaning begins faster. The LCD Refrigerator with apps has been updated and refreshed with the Grocery Manager app, which tracks the expiration time of perishables. This new addition is a direct response to consumer feedback for more efficient ways to control the waste and cost of spoiled food. The new 32 cu. 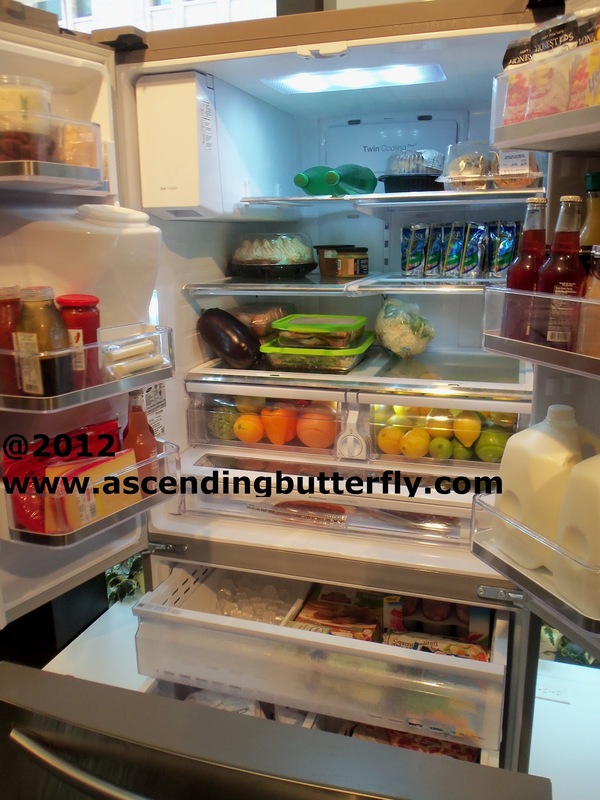 ft. French Door Refrigerator is the largest in its class and has enough room to fit up to 32 bags of groceries. That means fewer trips to the market for mom. The 4.5 cu. ft. king-size capacity High Efficiency Top Load Washer does 2.4 laundry baskets (or 32 bath towels) full of clothes at a time, reducing the amount of time spent in the laundry room. Mom can also rest assured that her clothes are being gently washed by foam and water jets. 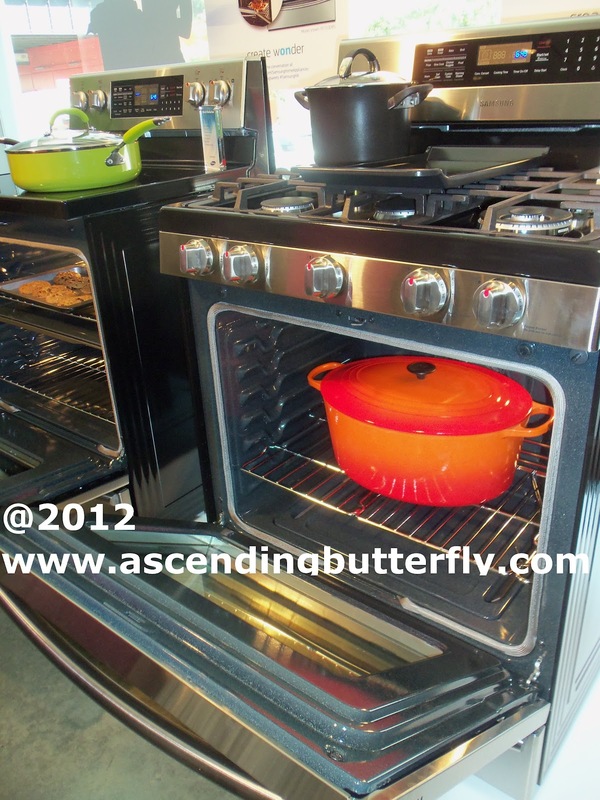 The Flex Duo Oven can split from one large capacity oven into two separate 2.7 cu. ft. and 3.0 cu. ft. ovens, giving cooks the option and convenience of preparing two dishes at two different temperatures. The new Induction Range with Flex Cookzone™ makes cooking easier with a flexible cooking surface which accommodates pots or griddles that would not fit on a standard-sized heating surface. It also features a boil sensor which helps eliminate boil-overs by alerting the user or automatically reducing heat to a pre-set level. The company’s new canister vacuums, available in the U.S. for the first time, come in three models – Champagne, Electric Blue and Black colors – and feature reduced noise levels and innovative ergonomic design, allowing busy moms to vacuum anytime of day or night even when the room is filled with family members watching TV or snoozing on the couch. So Butterflies, What do you think of these futuristic appliances? Ready to have your home resemble the Jetsons? I for one would also love a Rosie Robot! I want that kitchen! Patricia Heaton looks great! Beautiful photos..thank you for hsaring. Happy WW!!! @Brenda Cortes - Thanks! Happy Wordless Wednesday! @Crazedmom Thanks! The next night at an event my camera froze for about an hour! I'm super lucky I was able to retrieve my shots!